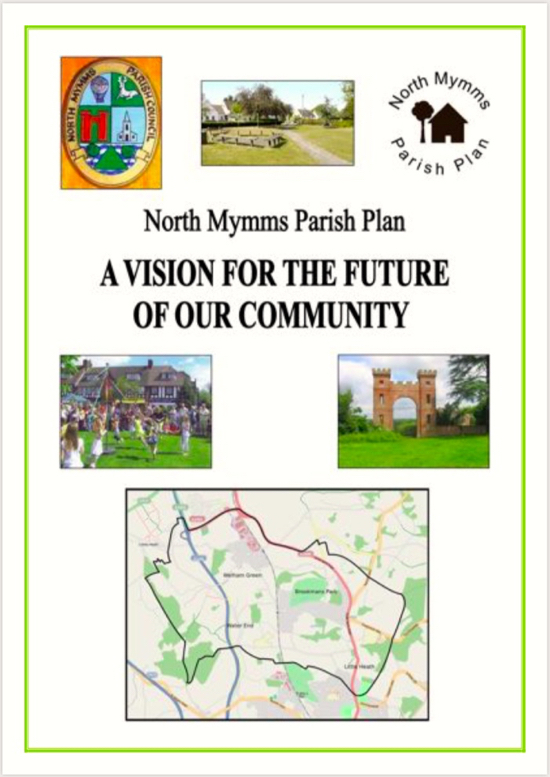 Do you remember the North Mymms Parish Plan? When it was published in 2011 it was hailed as “a blueprint for the future of North Mymms”. The plan’s authors described it as a “powerful tool to influence decisions”. Now, eight years on, the 36-page document is used by North Mymms Parish Council (NMPC) for research only; it is no longer available on the parish council website, and it has no legal status. The North Mymms Parish Plan was a time-consuming undertaking for the local volunteers who put it together. Many meetings were held to decide its scope. Thousands of questionnaires were printed and sent to 3,851 households and 400 businesses in the parish. A Parish Plan Steering Group Committee was formed, along with various working groups set up to analyse the findings from the questionnaire, draw up action plans covering topics such as housing, transport, the environment, and youth facility, and achieve agreed objectives. The North Mymms Parish Plan of 2011 was seen as “a focus to enable the villages in our Parish to work together”. And the whole initiative was sponsored by NMPC, which promised “to provide support and advice”. In retrospect a Neighbourhood Plan would have a better option, according to a number of local historians. A North Mymms Neighbourhood Plan would have been a more extensive undertaking and would have had some statutory power to influence the planning process, whereas the North Mymms Parish Plan did not. The North Mymms History Project has been researching the background to the North Mymms Parish Plan. Click on the box below to access the feature. In 2010 questionnaires were sent to every home and business in the parish of North Mymms. More than 4,000 documents had been printed. The aim was to gather feedback from local residents and those running commercial concerns about what needed to change in the local community.